The two AMD graphics cards we tested were provided by XFX. They were XFX RX 590 Black Wolf and XFX RX580 8G Black Wolf Evolution. 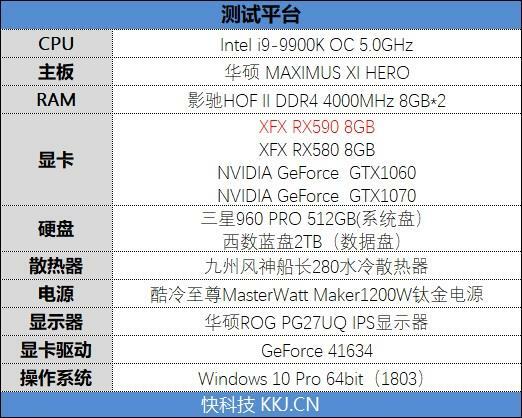 The RX580 frequency is 1411MHz, which is 71MHz higher than the public version of 1340MHz. 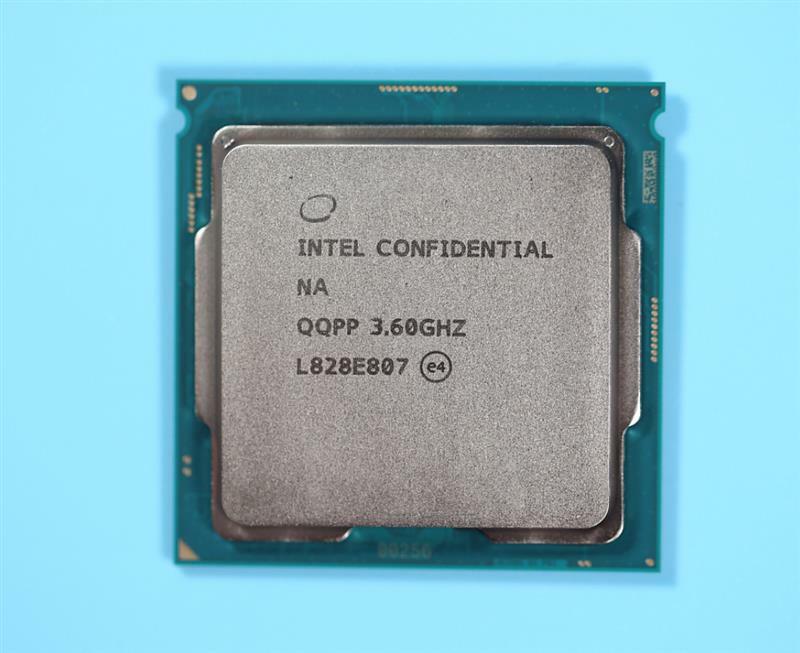 In order to maximize the graphics performance and prevent the processor from becoming a test bottleneck, we chose the i9-9900K platform and overclocked it to 5.0GHz. 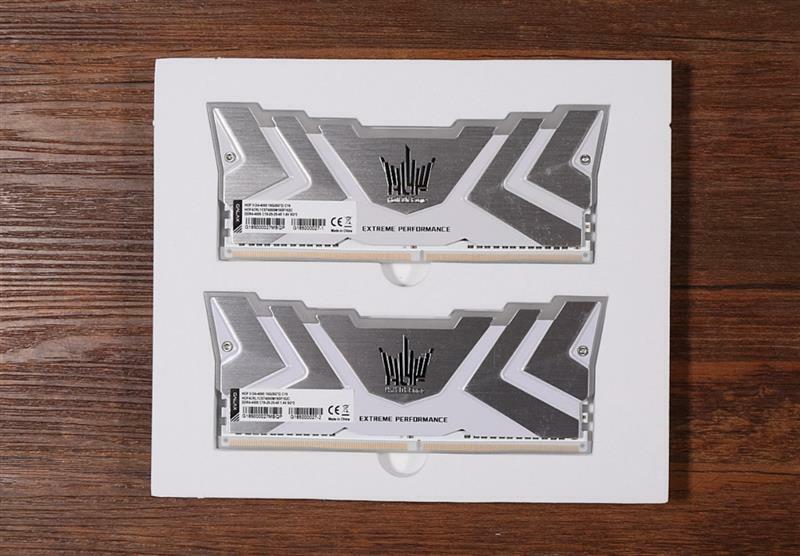 The memory uses the GALAXY HOF II DDR4-4000 8GBx2 package. In the test, the XMP is turned on to maintain the 4000MHz frequency, and the timing is 19-25-25-45 CR2. 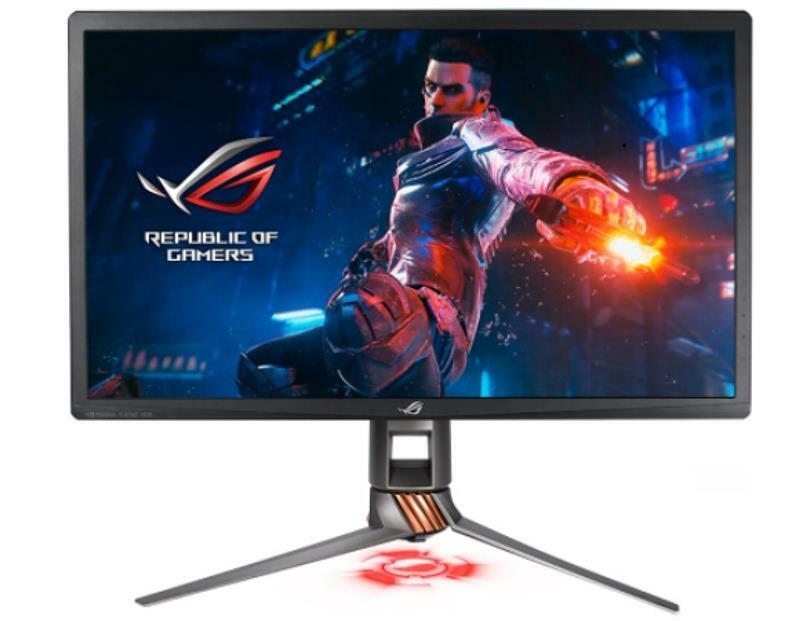 ASUS player country PG27UQ ROG 27-inch IPS gaming display. 4K UHD (3840*2160) resolution, 4ms response time, 144Hz refresh rate, G-Sync technology, IPS+ quantum dot panel, 10bit color, DisPlay HDR1000 certification. With all the features of the ROG PG27UQ is currently the most advanced e-sports display. 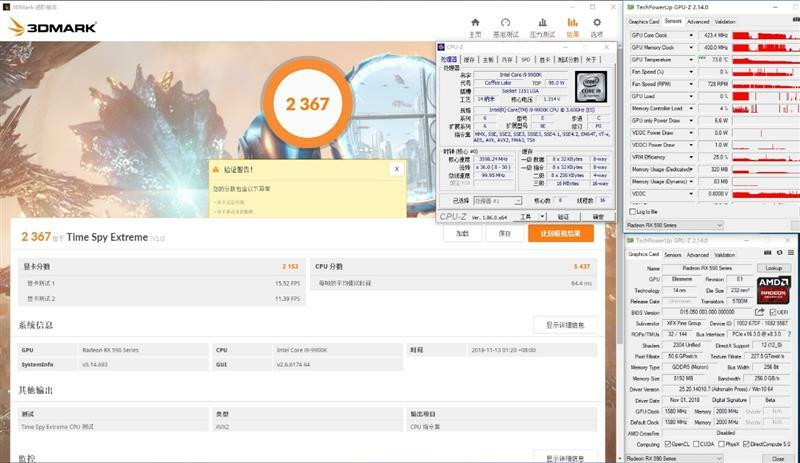 In the 2K resolution 3DMark Time Spy test, the XFX RX 590 graphics score reached 4,924 points, the core temperature was up to 75 ° C, the core operation was stable at 1580 MHz, and the maximum power consumption of the graphics card reached 225 W.
In the 4K resolution 3DMark Time Spy Extreme test, the XFX RX 590 has a graphics score of 2,153 points, a core temperature of 73°C, a core operation that is stable at 1580MHz, and a maximum power consumption of 225W. 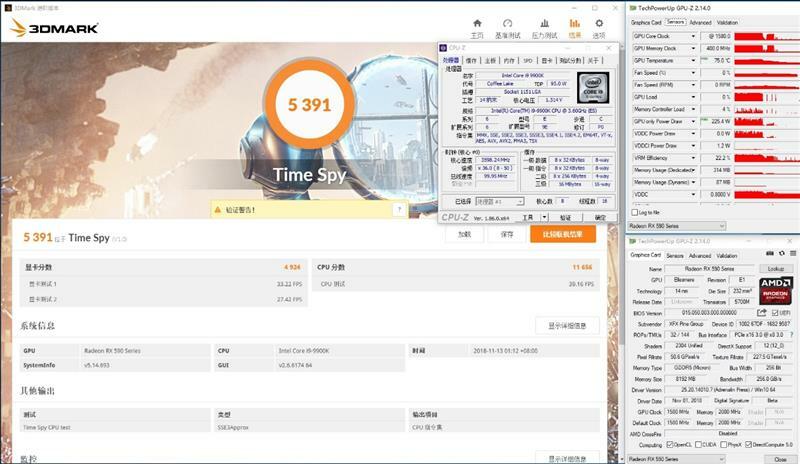 In the 3DMark Time Spy test, the XFX RX 590 can reach 10% of the RX 580 at 2K resolution, which is 16% stronger than the GTX 1060 6GB. In the 4K resolution test, the XFX RX 590 is 192 points faster than the RX 580, and the lead is also 10%. Compared with the GTX 1060 6GB, it has 224 points and 12%. 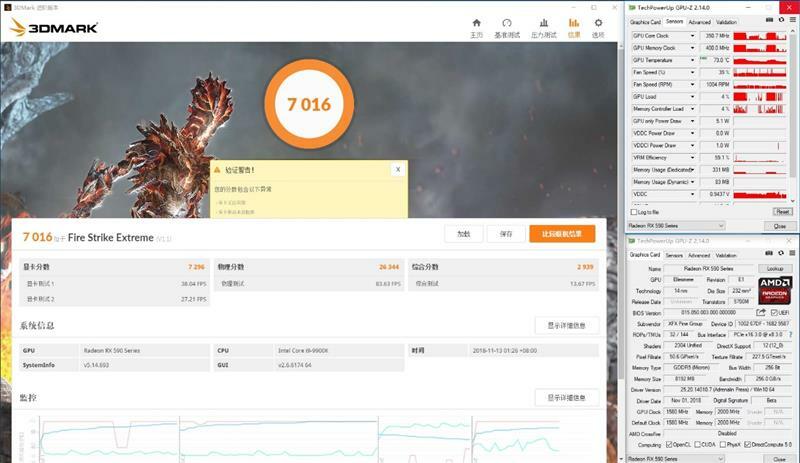 The XFX RX 590 runs 3DMark Fire Strike Extreme’s results are a bit amazing, the graphics score reached 7296 points, and GTX 980 Ti is no different. The maximum temperature in the test was 73 degrees. 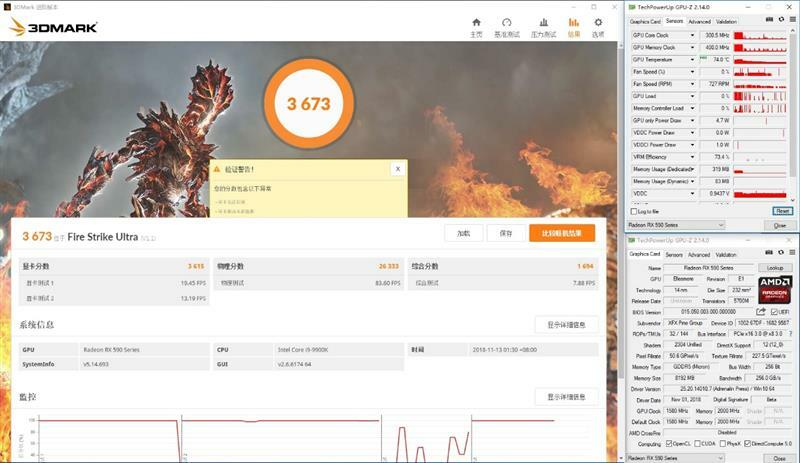 In the 3DMark Fire Strike Ultra test, the XFX RX 590 also reached 3,615 points with a maximum temperature of 74 degrees. In the 3DMark test, the XFX RX 590 is 25% ahead of the RX 580 at 2K resolution and 17% stronger than the GTX 1060 6GB. 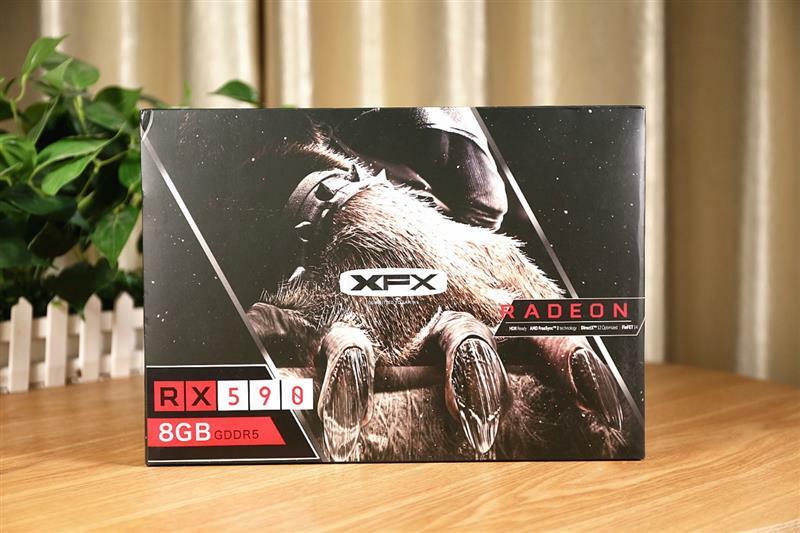 At 4K resolution, the XFX RX 590 is able to lead the RX 580 by 174 points, with a lead of 5%. Compared with the GTX 1060 6GB, it has an additional 631 points and a lead of more than 20%.